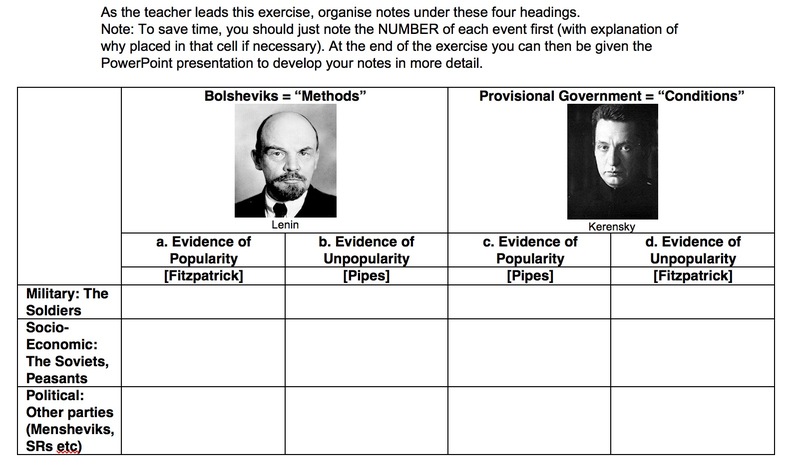 At the start of a new topic in a subject like history, it’s often necessary to familiarise students with an essential chronology of events before analysing this in terms of key questions. Simply reading through a timeline of events (or delivering a narrative lecture) to as a class is passive and unlikely to make the information ‘stick’. Instead, consider using the following strategies to help students engage with and absorb the narrative. The following ideas can be used in sequence, or in isolation, as a way of engaging your students with the essential narrative providing the framework for the study topic. This strategy is the subject of a dedicated blog post here and is a great way of getting students running around and feverishly making hand-written notes on the key events in a timeline prior to further development. It is particularly suited to quick-fire narratives covering dramatic events like the siege of Constantinople (1453) or the Spanish Armada (1588). 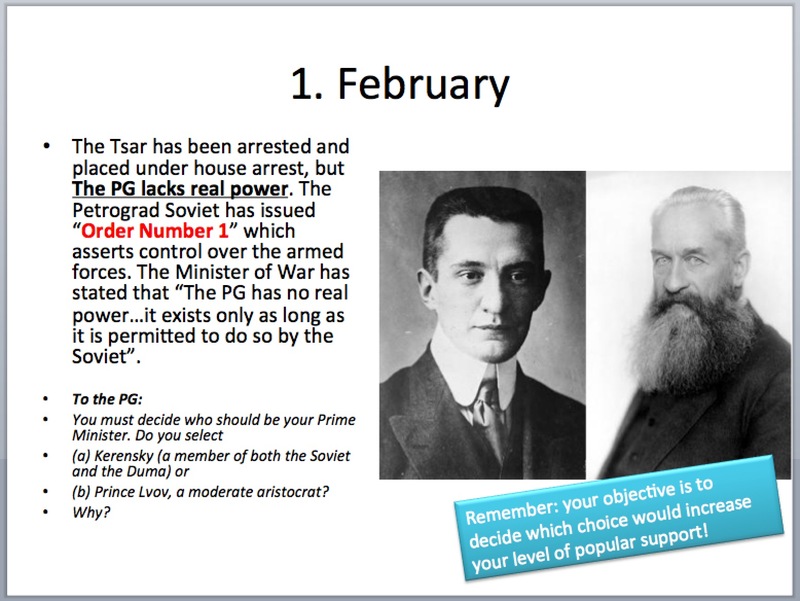 The process is repeated for other events – sometimes calling upon students to consider how the Provisional Government should act, and sometimes considering how the Bolsheviks should react. 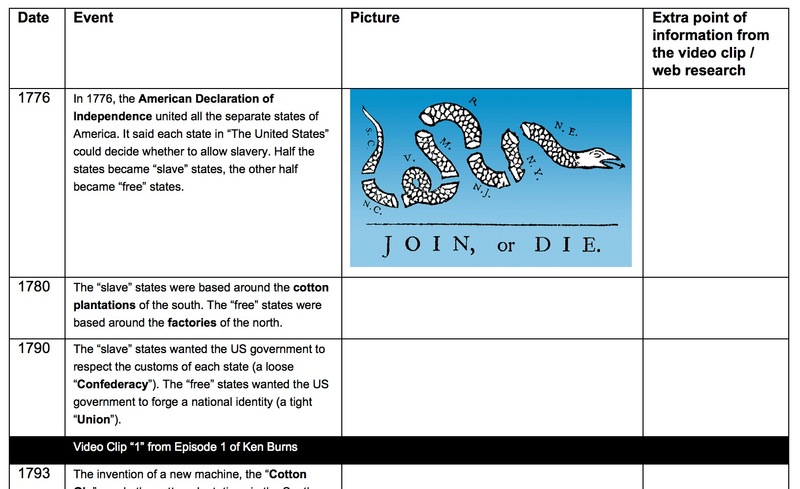 After the teacher-led element is finished, students can be provided with the complete PowerPoint presentation to develop their tables further (this is a highly efficient strategy to ensure that during the lesson they are focusing on formulating and writing judgements, rather than furiously trying to copy the factual information in each slide word for word). Idea 3: “Re-assemble this timeline into the correct order”. In “my guess” students number each event to reflect the chronological order in which they occurred (with “1” being the first event, and so on). The teacher then tells the class what the “correct answer” is for each event. Students then calculate the difference between the two numbers (note: this will always be a positive number – e.g. 5-3 would be a difference of 2, and 3-5 would also be a difference of 2). They then add up the total of the “difference” column to get an overall score: the student with the lowest overall difference is the winner! Note: if this exercise is used to introduce – rather than to revise – a topic, then some thought should be given to providing some contextual clues within each “event” about what happened previously, or what is about to happen next (e.g. “Because Harold promised to support William, he was then allowed to go home to England”). Following on from the above (or, with timelines that are too complex or detailed, starting at this point) introduce the key question for investigation (e.g. “What was the most important cause of the Spanish Civil War?”). 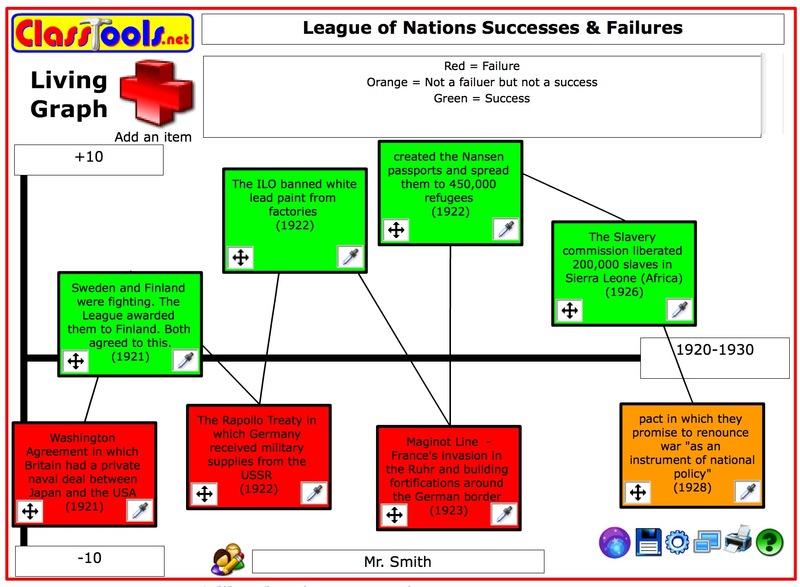 Provide students with a timeline of events. They then have to ‘cut and paste’ each event (if using a word processor) into the correct column provided, or (if doing this as a paper-based exercise) tick the appropriate column to indicate which category the event fits into. This is of course similar to dividing the events into columns just mentioned, but the benefit here is that the two approaches can be used in tandem to analyse the timeline in two different ways simultaneously. Students then have to justify why they have placed the event in that particular place, and colour-coded it in that particular way, by developing the sentence in their own words. Students then have to consider the key turning points in the narrative and ‘chunk’ the timeline into appropriate ‘chapters’. This is a useful way of helping students to see the ‘bigger picture’. The following example from a worksheet on my website ActiveHistory illustrates this process in action. 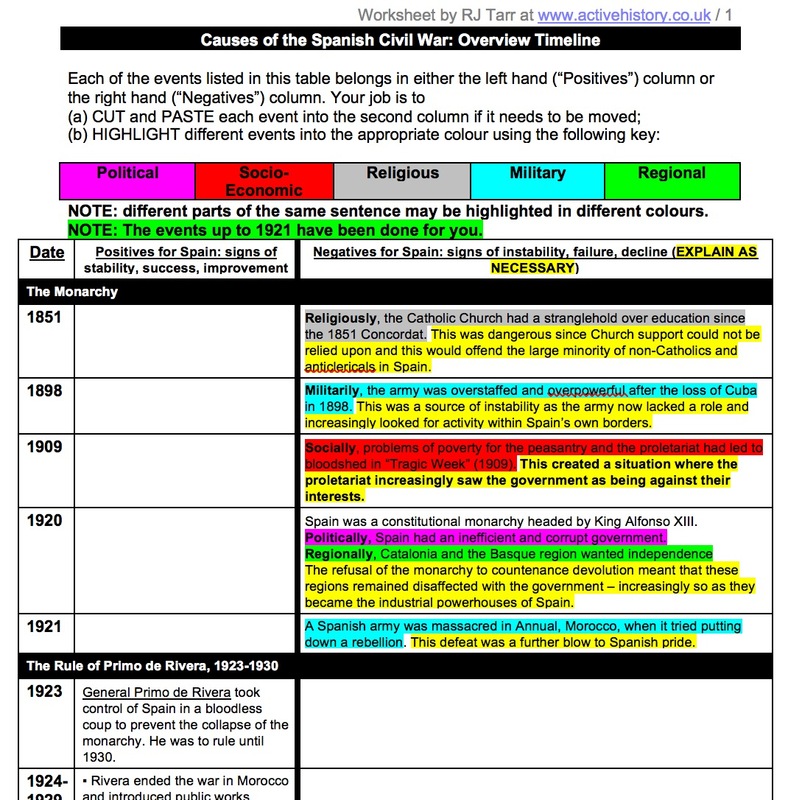 A detailed timeline of events leading up to the Spanish Civil War is provided. Students have to divide these firstly into columns to indicate evidence of stability and instability in Spain before 1936. Then, they colour code each event to reflect whether it is political, socio-economic, religious, military or regional in nature. At this point they are already getting an idea of which factors are coming up most frequently, at different times, and if they are a source of trouble for Spain, or maybe the opposite. Finally, they have to explain their reasoning by elaborating upon each event. The end result is that the students have been provided with the essential background information and – much more importantly – have started to ‘own’ that knowledge by transforming it into something much more analytical and reflective. To lead students into an independent research activity, discuss the sorts of questions that the timeline leaves unanswered. These can be in the form of “describe” (what, who, where, when), “explain” (why?) and “assess” (to what extent?). Many of the points in the timeline will require substantiation. In the pictured example shown above, the statement is made that “The army was overstaffed and powerful”. But how do we prove this? How can this be measured? Students should identify as many of these statements as possible, turn them into questions for research (“How do we measure whether the army was overstaffed?”) and then set about finding the answer. This is particularly valuable to teach students the importance of substantiating their arguments. It also helps students formulate proper questions for research, in a form that cannot be answered by a straightforward ‘Google Search’.